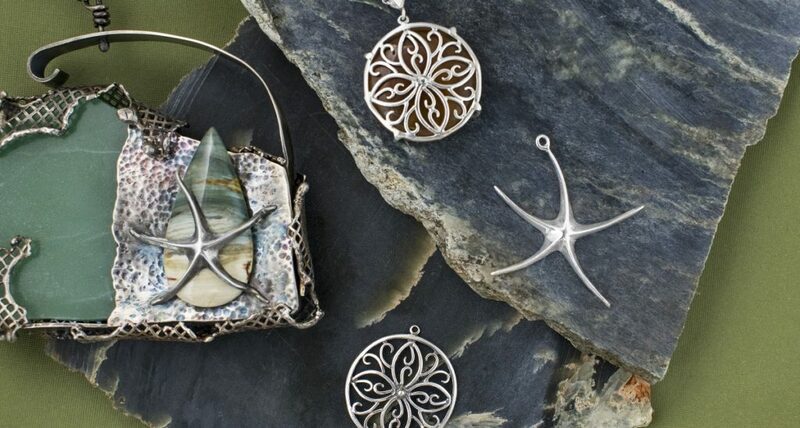 Repurpose jewelry findings in new ways and watch your design possibilities soar. At Halstead, we love to think outside of the box and find unconventional ways to use findings. In the last six months, I’ve chopped, changed and reimagined many of our conventional components. I’ve gathered a collection here of favorite hacks which I think you will enjoy. Watch the materials you know and love become something completely different. 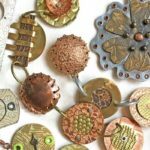 It’s easy to snip off the rings or loops from charms and file down the burrs to create versatile solder ornaments. Sweat solder them to bangles, collars, rings or backplates. Solder-on simple posts to make trendy earring studs to wear solo; or, use an intact charm as a dangle or jacket to take them up a notch. Use your new ornaments alone or in clusters. Once you start, you won’t be able to stop. Bead cones look gorgeous nestled on the ends of round beads, but, how will they look as crystal point cap settings? 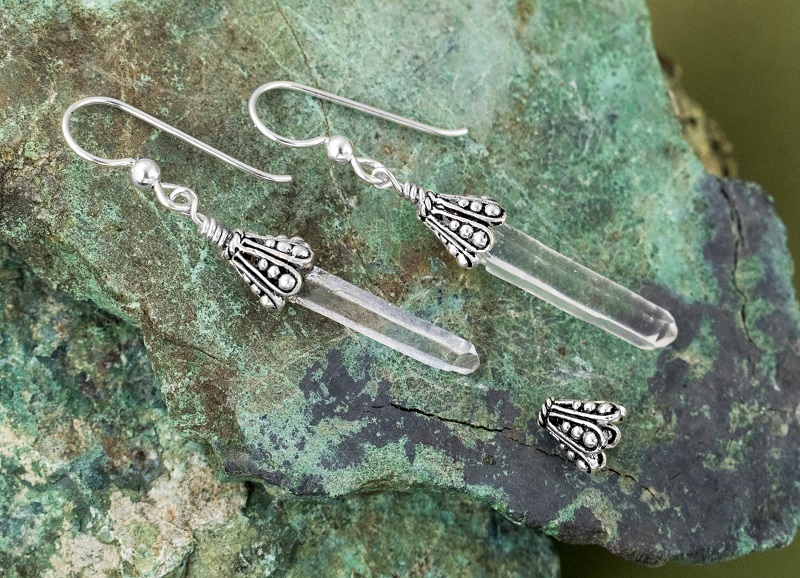 This quick little project uses wire, an earwire, a touch of adhesive and, of course, a crystal point. Cones are a quick alternative to fabricated gallery wire settings. Fast, fabulous and fun. Spacer beads work great on an assembled necklace to break up the repetition of the beads, however, did you ever imagine one soldered on a finger ring with a CZ setting in the middle of it? 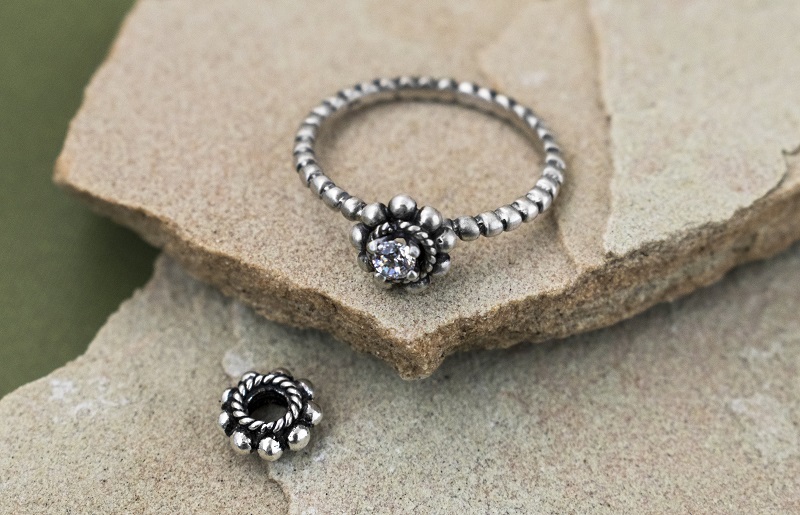 Beaded rings and findings are popular, so with this piece you’re bringing Bohemian style into the mix with a CZ set in the center. You will need a large hole heishe. It’s a fun ring to make! Need a hole? Make your own! Use a flex shaft or drill press to quickly add attachment holes to blanks or charms. Abracadabra—new chandelier earring links! Or, use this technique to change one-hole charms into simple two-hole links. 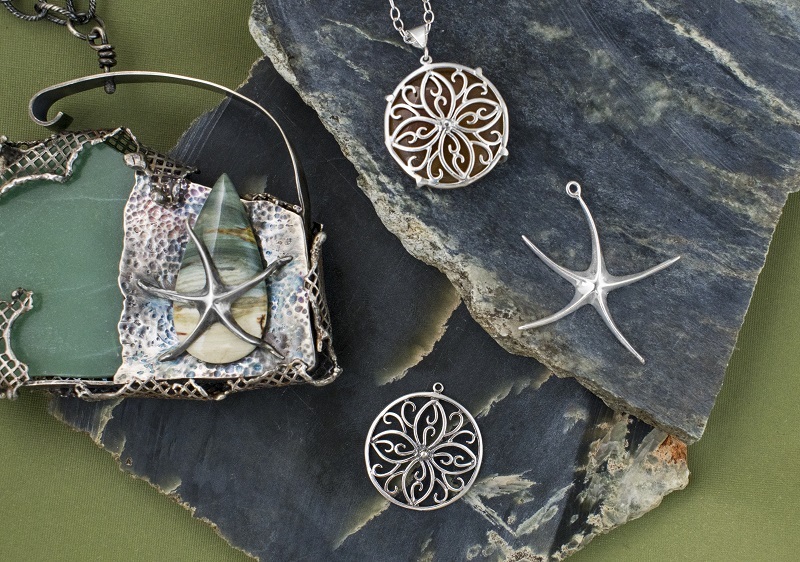 How can you attach a cabochon to a sterling silver back sheet and still keep the ocean theme of a piece? I decided to use the long arms of a starfish to do the job. I bent the arms with nylon pliers, soldered 4 out of 5 of them to the sheet, slipped in the cabochon and then hammered the starfish down onto the cab with a rawhide hammer. Ocean themed pendant! For the second necklace shown here, I added prongs to a filigree pendant to create a window setting for a low dome cab. I shaped the piece to lie flat against the surface of the stone and tightened the back prongs to secure it in place. 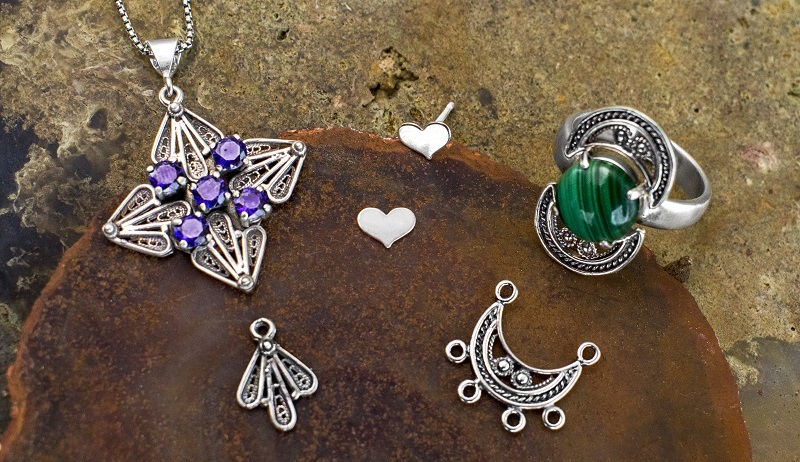 Imagine what other pendants or charms you could repurpose as settings! About the author: Erica Stice is the Studio Coordinator at Halstead in Prescott, AZ. She’s addicted to the flame of the torch and is always looking for excuses to solder. Photos courtesy of Erica Stice and Halstead. 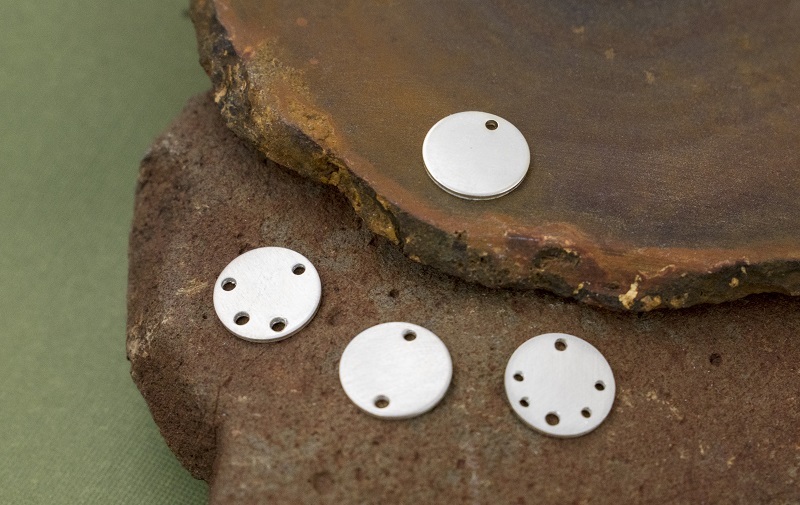 Learn more about making and using jewelry findings with these resources!